It is safe to say people love their technology; computers, tablets, cell phones, apps, etc. And maybe a little too much, but that also means there is a demand for more jobs in the technology field to keep up with the demand for new innovations. According to 2014 Department of Labor growth rates, computer and information technology occupations are well above the average for all other occupations. The eye-opening statistic is only 26% of workers in computer and mathematical occupations are women! And only 3.9% of the tech c-suite are women. The number of Pullman Foundation women in tech are low as well, but we did have a peak of tech majors in the 1980s when the nation also saw this surge– when personal computers started moving into U.S. homes. Currently, we have zero female students majoring in technology fields and about 100 female alumni who majored in these fields. 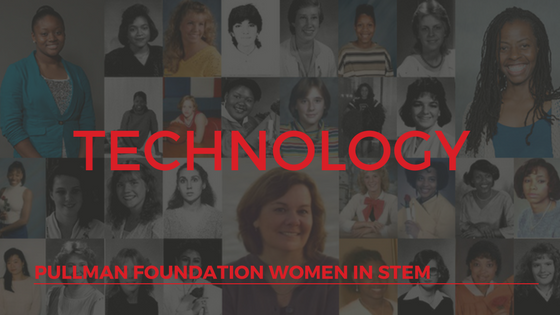 This week we will showcase one of our Pullman Scholar Alumnae, Jeanne Hultquist, who entered the technology field in an unconventional way and provide information about the current state of women in technology. If you are a Pullman Scholar Alumna in the technology field, please contact Katie Desir, to share your story! Read Dare to Take Risks — Switching From the E in STEM To The T here. Read The Key to More Women in Technology (TEDx Video) here. Watch Learning From Pullman Alumna Jeanne Hultquist here.